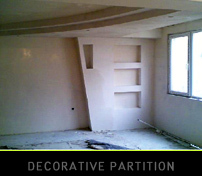 One of the most beautiful and eye catching solution for dividing a room, office space or a shop is by installing decorative partition walls, which give modern open plan feeling. The Decorative Partition Walls are not only useful but they can provide acoustic and thermal insulation as well as improving sound quality in critical areas. 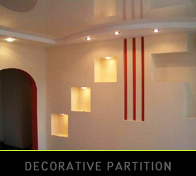 The Customer can choose the form and the shape of the partition to ensure this will be his /hers unique style. 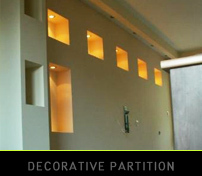 We, are Meto Interiors Ltd can organise for hidden lighting to be incorporated with the design of the shapes of partitions as part of our package.